HCM City (VNA) – Vietnam has a lot of advantages to join regional trade agreements (RTAs) and free trade agreements (FTAs), said delegates to the APEC SOM Dialogue on RTAs/FTAs in Ho Chi Minh City on August 27. Ambassador Robert Holleyman, President and CEO of C&M International, LLC, told Vietnam News Agency reporters on the sidelines of the dialogue that Vietnam has a large, growing population, as well as a global footprint in trade. 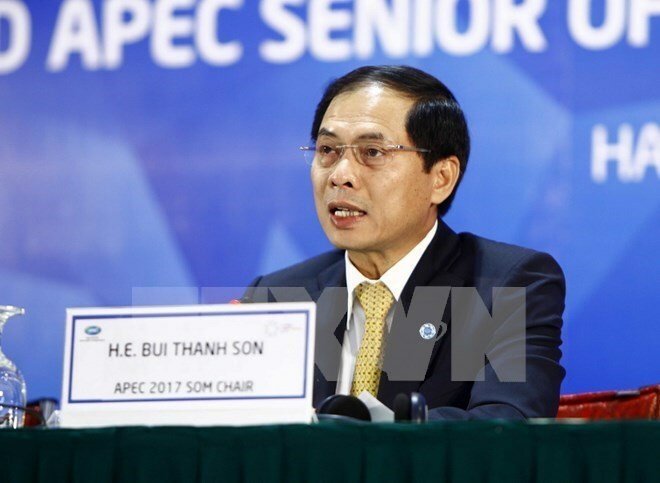 “Vietnam’s leadership in hosting APEC this year is a big signal that Vietnam is a key player in wanting to be integrated in the Asia-Pacific economy and in taking steps to ensure that it is integrated with other economies in the region,” he said. “The efforts by Vietnam to bring the parties together in this host year and talk about the future of trade in Vietnam is important and it’s great to see what has been done by Vietnam,” he added. Echoing Robert Holleyman’s views, David HSU, Deputy Director General of the Bureau of Foreign Trade under the Ministry of Economic Affairs of Taiwan (China), highlighted Vietnam’s young population, diverse natural resources, favourable geological location and hard working labour as advantages for the country to participate in the trade agreements. According to Bui Thanh Son, Vietnamese Deputy Minister of Foreign Affairs, Vietnam has so far negotiated and signed 12 free trade agreements, and is negotiating four others. Joining trade agreements can help Vietnam access foreign markets, seek long-term and stable markets for local goods, particularly agro-forestry-fishery products, footwear and electronics, and improve competitiveness of Vietnamese businesses, he said. Integrating into the global community should be very positive, particularly for a country like Vietnam, through liberalising and opening up new trade, he said. Marie Sherylyn D Aquia, Chair of the APEC Committee for Trade and Investment (CTI), Department of Trade and Industry, the Philippines, said FTAs and RTAs set a lot of rules regarding trade facilitation like customs procedures, rules of origins as well as how to treat technical barriers to trade and liberalise certain goods and services. “These rules are important and useful for businesses to make plans. And it’s also good, because RTAs/FTAs talk about market access, keeping your economy open. So having an open economy is very useful for consumers and businesses, and for goods to enter countries freely,” she said. Marie Sherylyn D Aquia said businesses should know that there are preferences available that they and exporters can use. David HSU also suggested promoting the involvement of the business circle in negotiations of these agreements. Regarding challenges faced by Vietnam when joining trade agreements, Deputy Minister Son underscored uncertainties of the global economy, further explaining that many economies have still used both tariff and non-tariff tools to protect their domestic markets, thus hindering efforts towards trade liberalisation and market opening. David HSU pointed to Vietnam’s weaknesses in high-tech and high-quality production. Besides, such sectors as agriculture, processing and material supply have also faced a range of difficulties.